Become an expert on the R statistical environment and how it applies to biological data analysis. With this online course, you will gain valuable skills, such as using R for analyzing diverse data types from very different biological experiments. We will dive into the theoretical aspects of the introduced methodologies, and after that, assignments and activities will provide you with opportunities to explore the practical ways of performing the analysis. 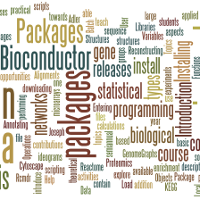 This course is relevant for molecular biologists and will teach you how to perform simple sequence analysis with R. You will get the essential overview of biological network analysis, as well as the highly popular enrichment analysis of gene lists. Special Requirements: You will have to use the R software for the practical parts of this course. R is a free software programming language and a software environment for statistical computing and graphics. You have to be able to install this free software on your computer. 6 course weeks supported by a practiced bioinformatics lecturer. In addition to the material you will get active assistance to gain the most benefit from this course. After the start, you will be able to access all material for 4 months. Register this way: Select the box next to the course, and pay for the access using PayPal or your credit card by clicking on the PayForCourses button below. You will be automatically registered to the course during the payment process. You will get detailed instructions about how to access the course material after your payment was processed.